With Easter coming up, I guess bunnies are on my mind. 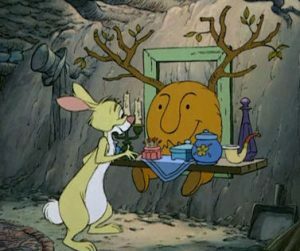 Since I have been thinking about the importance of routines and rituals with regard to caregiving and grief, I am going to put the spotlight on Winnie the Pooh’s buddy, Rabbit. Rabbit is the friend who has to have everything just right, who gets flustered when anything goes wrong or things are not in their proper order. 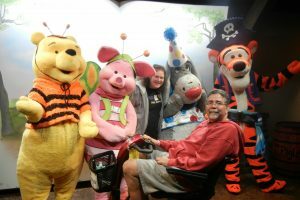 He saw himself as the caregiver of his friends Pooh, Eeyore, Tigger and Piglet. Chances are, as a caregiver, he would put excellent routines in place. He would organize schedules and supplies with impeccable care. He would also be sent into a tizzy at the slightest change in plans but would try to come up with a work-around. Crises might send him into an utter tailspin but Rabbit would be the one to try to solve a problem, possibly more to maintain the order he needs in his world than to show compassion. I think that he might make me nervous if he was my caregiver. And, as caregivers know, trust and compassion are key. What do you think? Although chaos became my normal during my years of caregiving for my dad and Ben, routines were a great starting point. Since I was working while Ben was at home, we had several routines in place for his safety and ease of getting through the day. I arranged his food so that he could get to it easily. Rabbit would have been furious with my inability to keep things neat, but my priority was to accommodate all kinds of supplies and move things wherever they fit to make other things accessible for Ben. At one point, my dresser was against my closet door and I basically stuck my arm into the closet and grabbed whatever I could, hoping it would be a coordinated outfit. Rabbit would never approve. I tried to see the humor, but humor is not Rabbit’s strong suit. Every day, Ben sent me a text to let me know that he was awake and at his desk and I knew when to expect those texts so I did not worry. I texted when I left school and he let me know if he was okay and if he needed anything. Of course, we also texted throughout the day, and in the case of a problem. Texting became essential when he had trouble answering, holding and speaking on the phone. As each event of ALS struck, we came up with a plan to deal with it. After he died, I missed those routines, especially sending my daily, “I’m free!” text to let him know I’d left school. It’s those routines which seem so silly that became rituals and those are the ones that can still make me cry when I think about them. Ben and I lived in an apartment building without a doorman, and when Ben had trouble getting to the buzzer, we had to make special arrangements if someone was to visit and I was not home. Ben was in a visiting doctors program through Mount Sinai Medical Center, and those appointments could be hard to schedule. When Ben did hire a private pay aide for a few hours each weekday, all visits had to be coordinated when she was there or when I got home from school. It was a finely choreographed day! However, even the best ballerina sometimes trips or falls on stage, and as most caregivers know, days can be very unpredictable. At least routines offered a structure and a jumping point. Ben and I also did maintain our rituals whenever possible. We went to the opening weekend of Disney films until he could no longer get down the stairs to go outside. When we were fortunate to be able to return to Walt Disney World, we enjoyed the attractions that we loved, even though there were challenges. Ben really did not want ALS to stop him. On holidays, I decorated the apartment after I put Ben to bed, so that he would have a surprise waiting for him in the morning. When I lost Ben, I lost my structure. There were no routines in place. I only had to tend to myself, and, frankly, that’s never been my favorite thing to do. I could spend an entire day sitting on the sofa thinking about what to do, and end up doing nothing, relieved that I could just go to bed but lamenting how unproductive I had been. Work became an important routine because it did structure my day and get me out of my apartment. I worked at a stress-filled middle school, but it filled my hours and gave me purpose. In what was suddenly my free time, I wrote a lot, in what has ultimately become this blog. I started to do things that I missed, like socializing with my friends and going to the theater. But, theater did not offer the same escapism and diversion as it always had- I felt guilty about enjoying myself, I had too many memories of when I could not go to the theater and how difficult it was to enjoy myself when I was able to go out, and I had to accept that I would never again be able to do these things with Ben. I spent many weekends staring into space. I was hard-hit by Ben’s absence, just a year and a half after losing my dad, which was another loss of routine, and the people who had consumed my life and my heart. For the first year, I marked in my calendar every single Wednesday, the day Ben died, noting how many weeks had passed, and thinking about him even more than usual, setting aside time to reflect and remember. Rituals have become a vital part of my being able to dive back into the world of the living. I have maintained some of Ben’s and my rituals and created new ones that honor our relationship. I continue to attend opening weekends of Disney films, as I did last weekend at A Wrinkle in Time. I go by myself because I cannot imagine being with anyone else and it is emotional for me. When I am by myself I can feel Ben with me. I know that some people think that’s strange. I have not yet returned to Walt Disney World. Although I had been there before I met Ben, it was a most special place for both of us and, after his ALS diagnosis, it was the one place where he transcended the disease and felt most free. Our favorite time of year to go was around my birthday, which coincided with the Halloween celebrations. I don’t know if I will ever be able to resume that tradition without Ben. I have written about how I have made it a ritual to put Ben’s favorite Christmas tree ornaments on the part of the tree where he liked them so he could easily see them all day from his desk. It feels right. I continue to look over at his desk chair, which I have also kept despite its shabby condition, and I feel comforted to see his computer still in its place of honor. There are so many memories are there. I have also written about how when Ben’s computer crashed, I hired someone to restore it so that I could keep playing his music playlists from his computer (click for post). One of the reasons that Ben’s computer and its music library is so important to me is because music was so essential to Ben’s being. When we first started dating, he often gave me lyrics to Beatles love songs. On my birthday and on our anniversary, left special videos and music clips for me to play. Now, on his birthday, I play for him the Beatles “Birthday.” It makes me cry but I look forward to what I have made a ritual and in my heart I know that wherever he is, he hears it. I’m ok with tears. Sometimes the emotions have to come out, and, with them, come beautiful memories. 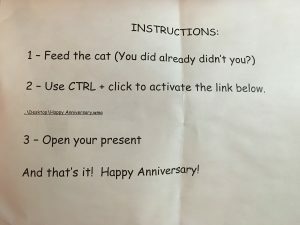 One of Ben’s notes with instructions for his musical anniversary surprise for me. As you can see, he always knew that Disney took priority! I also created a special music playlist called “Ben.” This playlist contains songs that were special to us for different reasons, both happy and sad. One song, “In My Life,” was his favorite Beatles song, and a song that was played for him by a kind and talented musician on the day he died. “It’s a Small World,” because we loved that attraction and he always teased me that it was my ringtone and ringback tone on my phone. “The House on Pooh Corner,” because Ben’s doctor, in an effort to provide some level of comfort and cheer on the day Ben separated from the vent, found the video and played it on his phone for us to watch, and that touched my heart. And, there are a few other important songs. It is my routine and ritual to listen to this playlist every single morning on my way to work. No matter what happens, Ben is with me as I start my day. It gives me a sense of comfort and security and it gets me moving despite how I’m feeling. I guess rituals and routines are sometimes interchangeable for me. But, it gives me a sense of grounding to know that I will be watching Monsters Inc, Toy Story (1,2, and 3) and The Incredibles on Ben’s birthday or even the sad milestones of his going into the hospital and his passing. They are simple and sentimental ways of honoring the unique and special parts of our relationship. I was never like Rabbit. I am a horrible housekeeper, and I could never keep things in great order, though I did keep our lives completely organized around Ben’s care and well-being. I like to think that Rabbit would have appreciated that I am, however, insistent upon my routines and rituals when it comes to honoring Ben and the things that were unique to our relationship. No matter where life takes me, these routines and rituals give me a sense of security in the present and the knowledge that I bring the love from the past along as I move forward. Halloween 2012 at Walt Disney World. We never met Rabbit (there was probably too much frolicking), but had fun with his 100 Acre Woods buddies.